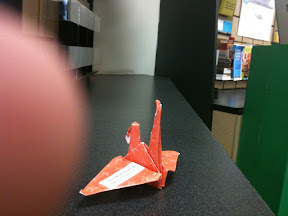 The paper of this crane and the next one are compliment of Nikki Sivils and Lanie of Nikki Sivils, Scrapbooker. 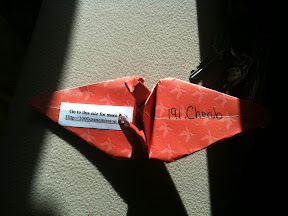 She sent me a few different things but the 6x6 book turned out to be the perfect size for crane folding. I'm going to intersperse the rest of the sheets among my other cranes. Thanks for the paper for my cranes ladies!